Joe wouldn’t be opposed whatsoever if Bucs AC/DC-loving general manager Jason Licht spent his first two draft picks on defensive linemen. Why? First, Jason Pierre-Paul, who Joe loves, is no spring chicken. Second is his salary (see this article). Third is JPP’s contract runs out after next season. Fourth is getting the opposing quarterback on his arse is beyond important. How many times does this need to be said/written before it sinks in, or are we so conditioned to bad football that we enjoy watching Drew Brees, Matty Ice and pouty Cam Newton have so much time to throw against the Bucs they can order wings from Hooters before being touched? Do not underestimate the Bucs’ salary cap crunch. Joe has been clear on what position the Bucs should draft at No. 5. And if a certain person slides to the second round, Joe would not lose sleep if the Bucs chose him. Who is “him?” Well, he is visiting the Bucs today at One Buc Palace as part of the Bucs’ 30-allowed private visits. 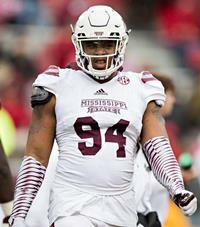 “Him” would be Mississippi State defensive lineman Jeffery Simmons. Jenna Laine of ESPN reported Simmons is at Casa Glazer today. Simmons easily would have been a first-round pick had he not blown out a knee training for the combine. Given how knees take time to bounce back, it’s very likely Simmons would need a full year to fully recover. That same calendar year would allow Simmons not be rushed into the lineup. The Bucs select No. 39 overall, the seventh pick in the second round. Joe can think of worse things to happen than picking two defensive linemen with the first two picks. Playing last year, his junior season, as a defensive tackle in the rugged SEC, Simmons had 18 tackles for loss, including 2.5 against Iowa in the Outback Bowl against a team known for producing NFL offensive linemen. We can’t waste a pick on a guy for next year. Our second round pick this year has to be a starter, it’s a deep talented draft, no way we should reach for projects, the future is now. Would love to be able to trade back a few spots, gain a 2nd round pick. Jefferey Simmons tearing his ACL is the only reason Im not fully on board with drafting a DT at 5. The smart thing to do, imo, trade down from 5. Then use an extra pick from the trade to move back into the end of the 1st round for Simmons to get the 5th year option on his contract because his rookie year could be lost because of the injury. Agree with Joeypoppems.. could grab Devin Bush possibly from pick # 10 to 20 in that scenario!! Most mocks have Simmons going in the middle to late 1st round. I agree that we need immediate impact players and not future projects. I just listened to the most recent Ira podcast about this topic. This ‘Joe’ needs some time on the couch and/or meds. He nearly injured Ira. 😜. Very entertaining. To borrow a term from this Joe, he is playing the role of the Shill, to a tee. Nice work. All that being said, I an now pulling for White at 5 just to watch the continued fireworks. Jason Licht has been pretty good at picking-up additional 2nd round picks, during his tenure with the BUCS. So If by some miracle Mississippi St. prospects DE/DT Jeffery Simmons & G/G Elgton Jenkins are still on the board; lookout! Yeah, seems like Jason’s trade up, kinda pick. I agree with Hodad. Need a big contributor from rd2 this year(every year). GO BUCS!! I think I’ve kind of settled on a wish list of 2 defensive front 7 players + an OG in the top 3 rounds. Williams/Bosa/Allen/Oliver at 5 or trade down. If they follow the above plan they can’t really screw up too bad. We’ll be sitting pretty for years to come. Jeffery Simmons balled out in that game. You have NO #1 corner, you don’t have a #3 corner (and no, counting on VH3 to be healthy all year isn’t what I’d call a #3 corner). Unless you’re just writing off this year already then you should care about that. If they don’t get a #1 corner high in the draft this season is already over before it begins. As stated before, look at the 2003 Bucs. They move Dwight Smith from nickel to safety and had NO depth at the position. When Brian Kelly went down and they had no one else that was even close to being worthy to play, it tanked the entire season. You had Sapp AND Rice rushing the QB and it didn’t matter since QBs would just take 2 steps and toss the ball to wherever Ronde wasn’t at. Address corner with a very high pick, or just accept another 5-11 season. Licht put the team in this position by not getting someone in FA. Damn, how many Passes Defended & Punt Blocks did this kid have? We are constantly being told that BA is in a “win now” mode…..so why on earth would he use a draft pick on a player who can’t play this year? More likely we would give up a first next year to get a player…..nobody has talked about that possibility. How did the Bucs end up 7th in the second round ? I like Simmons early in the second round,but i dont think he will be there. Unkess the Bucs can somehow trade GMC and trade back, ending up with 6 picks (instead of 3) in rds 1-3, he’s a luxury the Bucs can’t afford to use a pick on with no production in 2019. I’m sure he’ll go to some team in the 2nd round that can afford to wait a year. The rich get richer. Like the “values” instilled in physically punching a woman as a 300 pound man then. Is that “value-able”?? I think not. Regardless of the circumstances. You don’t put your hands on a woman ever, especially as a 300 lb beast that trains in a weight room, as a collegiate football player, wbere your body is most certainly a weapon. You don’t touch a woman, ever, like that. No matter how remorseful, or the story. Then….there’s the torn ACL. “Value”…in Sweat?? A bum ticker that controls the body….? Neah, not a “value” there either. Too many other DE’s worth taking later, like Burns or others. I see a few comments that would pass on drafting a player because of an ACL injury. Whenever a player is reported to have an ACL injury JBF consistently places a 1 year recovery time table on it without any knowledge of the actual injury. ACL tears are not all the same. Depending on the severity of the injury it may take a year but most likely not. He could be ready by start of camp. Point is, without knowing what the injury is, what was required to repair it, and a recovery time table , it’s not smart to assume that the player will automatically miss the season. Simmons blew out his knee training for the Combine……sounds like the injury was more recent……probably won’t be ready for training camp. Oh Hell No Joe, on Simmons…before Round 4 anyway (yeah, a WINNING team will snag him). Wasn’t just a knee, but he blew out his ACL this freakin’ year. He will NOT be available at season start, if this year at all. To ALL, an ACL tear, if full, is ALWAYS a crap shoot. Don’t gamble on it when you need to win now. Holy cow, why do I get this feeling if Licht drafts him, he will be saying, “Well, his impact will not be immediate, but he is going to light it up for us in the future.” Why do I feel like everything Licht does is to buy HIM time as GM? And people (aka the Glazers) believe this stuff? Case in point. Why didn’t they play Ryan Griffin a few games last year? WHY didn’t they ditch DJax at trade deadline? Both Koetter and Jason were playing for a future despite a lousy season…and the owners bought it. The fans paid–those who buy tickets. The few. No please, Joe. God no. No experiments. Don’t make me resort to drinking over the Bucs. Planning for the furture is never a bad thing. You have an….M.D. dude?? Honest question, portends an honest answer. Do you know what “portends” means??. Likely not. So beyond…a Web MD…concoction…you don’t know much of much. So. We find ourselves, where we began. Shhhh. If Q or Allen aren’t there, of course I say trade down if it’s there. Then you can grab Oliver, Sweat, Bush or worst case Jonah Williams can be a plug and play G this year and RT next year and for the future. In the second you have plenty of good prospects to choose from, hard to name because who knows who might sneak out of the first rd. Maybe Byron Murphy or Deandre Baker make it out. Maybe it’s Dexter Lawrence or Marquise Brown. Lindstrom, Jenkins, or Dillard. Either way, I will be thoroughly disappointed if our first two picks are not quality starters next season, this draft is very deep in the first few rounds. I would not be surprised to see JPP traded on draft day. It gives you cap relief and a pick in a very talented draft. I for one would hate to see JPP go but if someone comes shopping and makes the right offer, it is possible. Bucs would be crazy to trade JPP…he is a leader! Again before the draft, Joe and I are on the same page. Somebody above noted all ACL’s are different. Totally agree. If PCL is not also involved, the time table could be fine for Simmons. By the way, Simmons, Bryce Love, and Marquis Brown apparently all went back to Indy Combine doctors on April 10th and had very positive reviews. Also check out David Chao, MD football doc. He puts out an update on injured college guys before the draft. He also did an article on players from each team that he felt would have trouble playing well after their injuries. A couple of years back, he mentioned Noah Spence for the bucs saying too many problems with that shoulder tear. Why leave off your relentless adjectives? 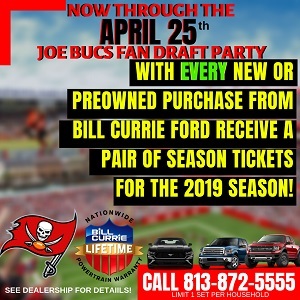 How about “Blown Knee, Girl Beating, Question Mark Linemen to go along with AC/DC Loving and Bucco Bruce fill in the blanks? Or you could simplify things and maybe just drop the tired ad hominems? @Joe … “Jason Pierre-Paul, who Joe loves, is no spring chicken.” For heaven’s sake Joe, JPP is only 30 years old. HE’S A BEAST, stop belittling him with this ‘age thing’. And yes his contract is up after NEXT season. So what? If his production is there & he’s still healthy, you re-sign him. Julius Peppers just turned 39. He’s played NINE years AFTER he turned 30. And in those NINE years, he’s played in 144 games, gotten 78.5 sacks, 343 tackles, 84 TFL, 125 QB hits, 22 forced fumbles, 5 INTs and 38 PDs. Not bad for an ‘old man’ huh. I love how every time you write (yet another) piece on “Bucs Simply MUST Draft a DE or the Sky Will Fall’ most … but not all … of the JBF commenters ‘second the motion’ that pressuring the QB is THE key to winning. Horsepuckey. It’s ONE of the keys, but it isn’t THE KEY. A solid defense ACROSS THE BOARD gives us the best chance of winning. Weaknesses get uncovered quickly in today’s NFL, and they get mercilessly picked on. Our LB position group is now ONE OF THOSE WEAKNESSES, and if we don’t fix that, this defense won’t perform any better than last year’s did. And of course you’ll be the first one in line to label Todd Bowles as “The Second Coming of Scapegoat Smitty”. DRAFT DEVIN WHITE. Why does Tampa sports teams always have to be the blunt of all jokes? Does this crap piss anyone else off? Defense Rules. The focus of the #5 pick should not be about fixing a specific position.Like the LB group like you said. The focus needs to be about getting a elite player. All-Pro Caliber needs to be the goal. Positions comes second. Ideally for this draft we can find an elite defender. Which is great cause that’s the strength of this class. If you want to address certain positions you use you’re other six draft choices or sign players or trade. You may even address these positions after the draft or during TC or even during the season if you need to. You just can’t draft a guy because he plays a specific position and leave a future star on the board. It’s way too hard to find a star player. That’s what makes a Top Five pick so special(and why you better think twice about trading). Hey if the Bucs think Sweat is a future star. Great go get him. And don’t freaking trade him away like a idiot. Get a star player at #5 and build around that with the other picks and roster moves. I’m tired……..My guess is you just watched a pathetic effort in game 2 of Lightning series. JimmyJack … We obviously disagree about using high picks to fix specific position groups. I’m a believer in PRIORITIES and my focus is on WINNING. We’ve drafted a number of ‘elite players’ over a number of years and yet we’ve barely had TWO winning seasons in the last TEN. And BTW, one of the two of us considers Devin White to be an ‘elite player’. As well as a potentially ‘elite leader’. I’ll give your 2 guesses which one of us that is, and the first 1 won’t count. Yup and the Rays giving up 6 in the 7th. It’s like what the hell is going on? On 620 I’ve heard how the lighting should sweep the first round and looking at the regular season against the blue jackets that would make sense however it’s the playoffs and nobody cares what you did during the regular season so you either take foot out of mouth or insert foot up their arse. Totorella is coming back to haunt us and I just don’t want to see these guys go out like Cinderella in a story. It’s time to either step up or shut up! Come on Tampa! DR I do agree with you about priorities. But to me that’s the beauty of the situation. Our biggest priority is fixing a last place defense. Every player ranked high in this class plays defense. We have no elite players on that side right now. We have openings at every position. The actual position doesn’t matter as badly. We just need a game changer, anywhere on the field, to add to our total of zero. And don’t worry about the Ray’s. They will save our pride. Ahhh Joebucsfan the guy who tells everyone on his site they are wrong and he is right. Would rather draft a guy that takes years to develop than an instant impact mlb who might pri bowl for 10 years. Same fellow who hounded for Manziel a while back. Stop trying to push your idea if the draft on your own fans lest you seem petty. Tvan once Devin gets in the building and wins defensive rookie of the year(cause he has greater chance than any of these so-called can’t miss pass rushers) they’ll come around bro. Trust me.. I bet he falls to the third round. related. However, He will be 100% start of summer camp. 3 recent cases , all with positive outcomes. in these matters is most obvious and only serves to …..humble …no I seriously doubt that your ego could suffer such an injury. Carry on Tbag. Not going to lie I’m against going LB with our first pick but I was also against picking a safety in Derwin James. My pick was Vea which is still not bad. I’m with Joe here in going Dline with the first two picks however due to how the league is evolving we could be wrong. Working in a corporate environment some of your worst mistakes you can make is going with what works for me now. A stable franchise can see how things are evolving. I say we go Ed Oliver or best line player available then Dline again as Joe states. In the end may the football Gods be with the Bucs! A lot of us resort to drinking BECAUSE of the Bucs. — and right now, because of the Lightning. With as many holes and ?marks as we have now would the smart play be to go with a player that has ?marks. . . and at #5??? Jason Licht should in no way be in power. Worst GM of all time. Fireeeeee Licht!